Upgrade every aspect of your computer's performance with Samsung 860 EVO SSD, designed with state-of-the-art 3D V-NAND technology. You'll get the 860 EVO's new 3-dimensional chip design that enables superior performance, greater reliability and superior energy efficiency, so you can work and play faster and longer than ever before. Samsung's innovative 3D V-NAND flash memory architecture breaks through density, performance and endurance limitations of today's conventional planar NAND architecture. Samsung 3D V-NAND stacks 32 cell layers vertically resulting in higher density and better performance utilizing a smaller footprint. Achieve incredible read / write performance to maximize your everyday computing experience with Samsung's TurboWrite technology. You can obtain up to 1.9x faster performance than the award-winning Samsung 840 EVO. The 860 EVO delivers class-leading performance in sequential read (540MB/s) and write (520MB/s) speeds. Plus, gain optimized random performance in all QD for better real-world performance. Samsung's magician software enables RAPID Mode for up to 2x faster performance by utilizing unused PC memory (DRAM) as a high-speed cache. The newest version of Samsung magician supports up to a 4GB cache on a system with 16 GB of DRAM. The 860 EVO doubles the endurance and reliability compared to the previous generation 840 EVO and features a class-leading 5 year warranty. With enhanced long-term reliability, the 860 EVO assures longterm dependable performance of up to 30 percent longer than the previous generation 840 EVO. The 860 EVO delivers significantly longer battery life on your notebook with a controller designed and optimized for 3D V-NAND that supports Device Sleep for Windows at a highly efficient 2mW. The 860 EVO supports 25 percent better power efficiency than the 840 EVO during write operations thanks to ultra-efficient 3D V-NAND only consuming half the energy than that of traditional planar 2D NAND. The 860 EVO comes fortified with the latest hardware-based full disk encryption engine. The AES 256-bit hardware encryption secures data without any performance degradation and complies with TCG Opal 2.0. Easily integrate into Windows with Microsoft e-drive IEEE1667 to keep your data protected at all times. The 860 EVO's Dynamic Thermal Guard constantly monitors and maintains ideal temperatures for the drive to operate in optimal conditions to ensure the integrity of your data. The Thermal Guard automatically throttles temperatures down when temperatures rise above optimal critical threshold. This protects your data while maintaining responsiveness to help ensure your computer is always safe from overheating. In three simple steps, the Samsung One-stop Install Navigator software easily allows you to migrate all the data and applications from your existing drive to the 860 EVO. The included Samsung magician software also allows you to setup, optimize, and manage your system for peak SSD performance. Этот SSD обогнал в 2-2.5 раза по тестам другие уже установленные SSD диски по тестам. Визуально работать все стало реально быстрее. В комплекте есть диск с фирменной программой для переноса (клонирования) данных с других дисков, хотя MiniTool Partition Wizard Free мне нравится больше. В целом: воткнул новый SSD в комп, перенес данные со старого винта, всё заработало. Просто. Быстро. This SSD has overtaken 2-2.5 times for other tests already installed SSD drives on all tests. Visually all became really faster. Included is a CD with proprietary software to transfer (clone) the data from other disks, although MiniTool Partition Wizard Free I like more. Overall: stuck a SSD in a PC, transferred all data from the old SSD, and that`s all. Just Quickly. Могли бы и винтики с кабелем положить в коробочку, а то пришлось идти в магазин докупать кабель и винтики. Could the cogs with a cable to put into the box, and then had to go to the store to buy a cable and screws. Товар пришел за 20 дней, без повреждений. Отличные скорости чтение/запись, соответствуют заявленным. В комплекте компакт -диск, с ПО для переноса операционной систему на новый диск. Все склонировалось в пару кликов. Goods come for 20 days, without any damage. Excellent speed read / write, the appropriate application. Includes CD-ROM with software to transfer the operating system to a new disk. All clone in a couple of clicks. нет винтов для крепления диска, а вообщем все отлично. no screws for fixing the disk, but in general everything is fine. muito bem feito, material de alta qualidade recomento . Otima construção recomendo a todos este produto, se você busca melhor desempenho em seu PC, Notebook, ou MAC esta é a solução a capacidade leitura de um SSD supera e muito a de HD convencional, mesmo que você tenha pouca memoria ou processamento a melhoria de desempenho é consideravel em no minimo 50% e o preço na GB é excelente, em outros sites ele custa bem mais caro esta versão 850 é a melhor custo beneficio que voce pode encontrar. Otima construção recomendo a todos este produto, se você busca melhor desempenho em seu PC, Notebook, ou MAC esta é a solução a capacidade leitura de um SSD supera e muito a de HD convencional, mesmo que você tenha pouca memoria ou processamento a melhoria de desempenho é consideravel em no minimo 50% e o preço na GB é excelente, em outros sites ele custa bem mais caro esta versão 850 é a melhor custo beneficio que voce pode encontrar. Спасибо Жирбесту - по хорошей цене! Посоны - винда теперь летает! Загружается за считанные секунды. Полезный софт идет в комплекте, для обслуживания диска и для резервного копирования. Единственный минус - слабая упаковка, а ехал в компании другого барахла, но как ни странно, повезло и диск оказался живой! SSD original Samsung, Meu Notebook e um Notebook Dell I11-3168-A10 Intel Pentium N3710 11,6" 4GB HD 500 GB Windows 10 Touchscreen que tava muito lento tanto para iniciar com para abri programas. So pra vcs intender 1,25 minutos para iniciar, para 0,25 segundos. Valeu apena. - Melhor investimento que já fiz. Totalmente recomendado. Dica: Pague o seguro! Se você é brasileiro, sabe como funciona os correios, melhor previnir do que remediar. ENG: 100% genuine, 100% recommended! Best SSD for price ! I bought this Samsung 850 EVO 250GB SSD from the recommendations and tests on the internet and I can assure that I am in no way disappointed with this purchase. Fast, solid (it fell from my hands as soon as the box opened), silent, and my PC has become a real beast now !!! As usual, all my thanks to Gearbest for their service and speed. Apart from that, nothing else negative to add. I wanted to buy an SSD for a long time and I was between this and 860. I bought this because of the price. Also, I chose to buy this one because of the brand and good reviews. This is the best SSD for the price. The cloning was very easy to do. I am still testing this but so far so good. Everything in the box was in Chinese. Which Operating Systems support Samsung 850 EVO SSD? All operating systems support Samsung SSDs, but not all operating systems are optimized to keep SSDs working at the peak performance. Can i upgrade the firmware of Samsung 850 EVO SSD? Are there other ways to upgrade the SSD firmware? The only way to update your firmware is to download and run the SSD Magician Tool. Do I need special device drivers for my Samsung SSD? No. SSDs are drop-in replacements for standard HDDs. Do I need a special SATA 6Gb/s (SATA III) cable for my Samsung SSD? Not really. All SATA cables are compatible with SATA 6Gb/s (SATA III). How can I check the performance of my SSD? Is it possible to connect my Samsung SSD via IDE? Is this advisable? There is a third-party adapter on the market to convert from SATA to IDE. However, Samsung does not recommend that you to use this type of converter and cannot guarantee that your SSD will be fully functional using such a device. What should I do if BIOS does not detect my SSD? 3. When there is a problem with the SATA Port, BIOS may fail to detect the SSD. Connect the SSD a different SATA Port and try again. My Samsung SSD is not detected as an SSD but as a regular ATA drive under Windows 7 Professional. Is this normal? Yes, it is normal for Windows 7 to detect an SSD as a regular ATA drive. Please note that Windows 7 will optimize the configuration of your SSD. I have a Sony vavo laptop with a very slow hard drive can this ssd hard drive fit in. Its MLC ou TLC version? Gearbest has warranty for this item. If I am taxed for customs, can I refuse and return the product? Could you declare the invoice price at $ 50 and mark it as a gift? We are so sorry to tell you that we cannot declare the package to a lower value or as a gift due to system issue. Hello, and original from samsung even? Still have stock? If you buy the 500GB version and it is possible to declare that it is the 120GB version and it costs less than $ 90 to avoid being taxed? Because I'm from Brazil. It can be sent out within 5-7 business days after payment. When are You gonna restock 500GB model? Sorry, the item is out of stock and can not be sold anymore (500 GB). Please consider the similar item instead. You might consider the 1T model. Does the product come in its original box along with the drive cd? 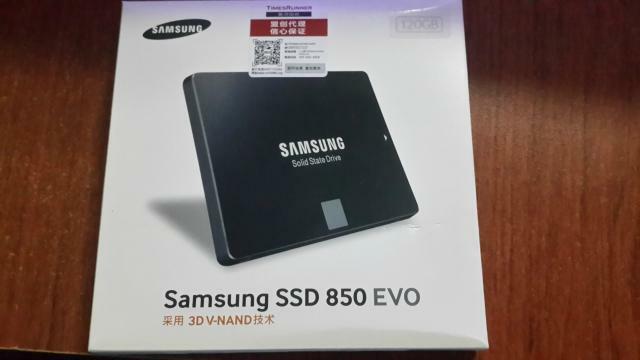 Este original de Samsung 850 EVO 500 GB unidad de estado sólido SSD de 2,5 pulgadas SATA 3 para Hardware funcionará como es. Gracias por tu atención. Hi! It really is original samsung product? Thanks for your inquiry. It's original samsung product. Have a nice day. Is this product an inbox one? I mean, it's complete with the adapters for CPU, nuts and bolts, power adapter, data-cable and CDs for drivers and clone-hd applications? Thanks. You send a generic warranty of international warranty Samsung? Does it guarantee in Russia? How much does it coast shiping to Croatia (EU)? Do I need to pay customs duty and tax? How much shall it coast in total? Thank you! Thank you for your inquiry,we can ship it to Croatia for free shipping,it is now $107.44.